Nicely Gift Wrapped Golden Plated German Silver Thali (Size: 5-6 inch) with Kaju Katli (250 gms Gross Weight) from Haldiram and 1 Free Rakhi, Roli Tilak and Chawal. Nicely Gift Wrapped Golden Plated German Silver Thali (Size: 5-6 inch) with Kaju Katli (500 gms Gross Weight) from Haldiram and 1 Free Rakhi, Roli Tilak and Chawal. 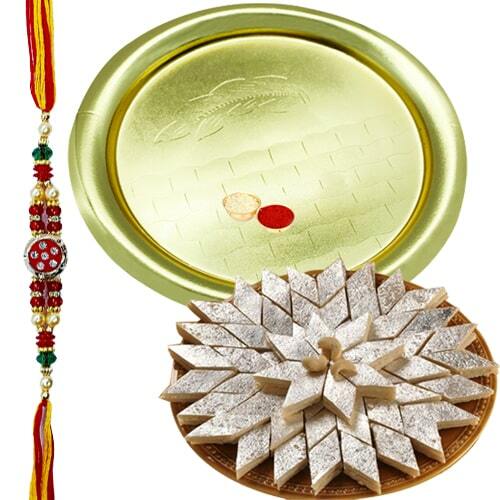 Nicely Gift Wrapped Golden Plated German Silver Thali (Size: 5-6 inch) with Kaju Katli (1 Kg Gross Weight) from Haldiram and 1 Free Rakhi, Roli Tilak and Chawal.